The community of Temelec sits on land that was originally part of the Temelec estate, consisting of Temelec Hall, its coach-house and surrounding acreage. 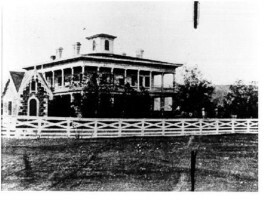 The gracious mansion that is now the center of the Temelec community was constructed by frontiersman and Bear Flag revolutionary Granville Swift in 1858. He was born in 1821, his great-uncle the legendary Daniel Boone. Having played a key role in the Bear Flag rebellion, Swift made his fortune in the Gold Rush of 1849, amassing enough wealth to build the grand “Southern” mansion using local stone and native American labor. Temelec Hall passed through several hands before being purchased by the Coblentz family in 1915, who lovingly restored the dilapidated structure. In 1961, the family sold the mansion and surrounding land to the developers of the Temelec retirement community with the proviso that the Hall be maintained as the centerpiece of the community. In 1936, Temelec Hall was declared California Historical Landmark #237. In 2006, Temelec Hall was added to the National Register of Historic Places. It now serves as the community center for meetings and activities, in addition to the location of the pool, picnic area, library, fitness room, community gardens, RV parking and administrative offices. The old access way to the coach-house is now a delightful walking path lined with walnut trees and bordered by vineyards. In the eighties and nineties, the community of Temelec sold off land that was intended to be a golf course for more homes for retirees. The two communities that resulted, Creekside and Chanterelle, are within the Temelec census tract but have their own independent HOAs.